Nothing But Thieves are an English alternative rock band, formed in 2012 in Southend-on-Sea, Essex. They consist of lead vocalist and guitarist Conor Mason, guitarist Joe Langridge-Brown, guitarist and keyboardist Dominic Craik, bassist Philip Blake, and drummer James Price. In 2014, they signed to RCA Records. 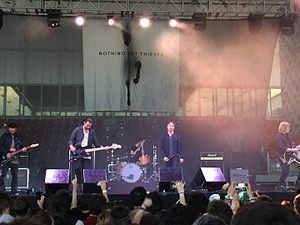 Their style of music has been compared to the likes of Foals, The Neighbourhood, and Civil Twilight, and they have been played on alternative and active rock radio. The band's single "Itch" picked up Hottest Record and Track Of The Day accolades on Radio 1 and also made it onto the Radio 1 playlist, as well as being added in regular rotation of Sirius XM new hard-rock channel Octane. The band were picked by Gerard Way and thereafter Awolnation to support European dates. They supported Arcade Fire and George Ezra at the BRITs show for War Child at the Electric in Brixton, performed at the NME Awards show, and toured with Twin Atlantic, Darlia, and Young Guns on separate support tours across the country. They have also been added to a multitude of European festivals including Reading & Leeds and Isle of Wight Festival. They have appeared twice on Radio 1's Live Lounge, Maida Vale session. In November 2014 they supported Twenty One Pilots alongside Purple at London's Electric Brixton. In July 2015 they supported Muse at the Rock In Roma show, playing in front of 30,000 people. Their debut album, Nothing But Thieves, entered the Official UK chart at No. 7, peaked at No. 3 on iTunes, and was No.1 on the vinyl album charts. A second British tour in April 2016, to be called the Under My Skin Tour, was announced on 9 November 2015. The band had to postpone some dates on their "Under My Skin" tour as they were asked to support Muse on their "Drones" tour. They tweeted their elation on Twitter, branding the experience "pretty awesome". In June 2016 they announced further tour dates in November and December 2016 in Birmingham, Manchester and London climaxing at the 5,000 capacity Brixton Academy. A small tour of UK clubs took place in late May 2017, to support "Amsterdam," the first single from their second album Broken Machine, released on 8 September 2017. On 5 August 2017 they played to a crowd of over 500,000 people at Woodstock Festival Poland. On 23 August 2017 they supported Muse and Biffy Clyro at Vital Festival in Belfast. Their UK 2017 tour was completely sold out. The band has also managed to sell out two consecutive nights at the Roundhouse in London. In November 2017, several members of the band were accused of inappropriate sexual behavior, resulting in an NME concert they were scheduled to headline being canceled. However, no civil or criminal charges were filed against any member of the band and, other than the NME cancellation and UK opening act July Talk withdrawing from future concerts, the 2017 tour continued as scheduled. The band addressed the rumours as false, and said they would take legal action on the situation. Tracks: "Forever & Ever More", "Gods", "You Know Me Too Well", "Take This Lonely Heart"
"I'm Not Made by Design"
— — — 29 —[A] 48 — — — — What Did You Think When You Made Me This Way? ^ "Forever & Ever More" did not enter the Netherlands Single Top 100 but peaked on the Netherlands Single Tip Chart at number 26. "Ban all the Music" in The Vampire Diaries episode "Postcards from the Edge"
^ Buckley, Kelly (17 July 2014). "We've just been signed to the same record label as Pharrell Williams and David Bowie". echo-news.co.uk. Retrieved 11 May 2015. ^ Johnson, Laura (4 March 2015). "AWOLNATION Unveil New Single Windows". Retrieved 14 June 2015. ^ "TWENTY ONE PILOTS + Nothing But Thieves + Purple: Fri, 14 November, 2014 - Rock and pop concert tickets in London and the UK - Stargreen Tickets". www.stargreen.com. Retrieved 13 June 2016. ^ Trendell, Andrew. "Muse announce support acts for UK Drones tour - tickets | Gigwise". gigwise.com. Retrieved 13 June 2016. ^ NME.COM. "Muse announce Nothing But Thieves as support act for 'Drones' tour | NME.COM". NME.COM. Retrieved 13 June 2016. ^ "Nothing But Thieves". Live Nation UK. Retrieved 13 June 2016. ^ "Nothing But Thieves '100% deny' abuse allegations made by fans on Twitter - BBC Newsbeat". BBC Newsbeat. 15 November 2017. Retrieved 21 November 2017. ^ Malt, Andy. "Nothing But Thieves deny sexual assault allegations, as NME cancels show tonight". Complete Music Update. Retrieved 9 June 2018. ^ a b "Nothing but Thieves". Official Charts Company. Retrieved 6 May 2017. ^ "Discography Nothing but Thieves". australian-charts.com. Hung Medien. Retrieved 6 May 2017. ^ a b "Discografie Nothing but Thieves". Belgium (Flanders) Charts Portal. Hung Medien. ^ "Discographie Nothing but Thieves". Belgium (Wallonia) Charts Portal. Hung Medien. ^ "Top 100 Artist Album, Week Ending 22 October 2015". Irish Music Charts. Retrieved 7 May 2017. ^ "Nothing but Thieves release history". Dutch charts. Retrieved 6 May 2017. ^ "Discography Nothing but Thieves". swisscharts.com. Hung Medien. Retrieved 6 May 2017. ^ "Nothing but Thieves – Chart History: Billboard 200". Billboard. Retrieved 6 May 2017. ^ "Nothing but Thieves – Chart History: Alternative Albums". Billboard. Retrieved 7 May 2017. ^ "Nothing but Thieves – Chart History: Rock Albums". Billboard. Retrieved 6 May 2017. ^ Collar, Matt. "The Vision – Nothing but Thieves". AllMusic. Retrieved 6 May 2017. ^ "British certifications – Nothing But Thieves". British Phonographic Industry. Retrieved 5 December 2017. Type Nothing But Thieves in the "Search BPI Awards" field and then press Enter. ^ "Broken Machine – Cassette (Store Exclusive)". Nothing But Thieves. Retrieved 20 May 2017. ^ "IRMA – Irish Charts". Irish Recorded Music Association. Retrieved 16 September 2017. ^ "Album – Classifica settimanale WK 37 (dal 2017-09-08 al 2017-09-14)" (in Italian). Federazione Industria Musicale Italiana. Retrieved 16 September 2017. ^ "New EP announced". www.billboard.com. Retrieved 27 August 2018. ^ a b c d e "Nothing But Thieves - Chart History". Billboard. Retrieved 1 June 2016. "Sorry": "Official Scottish Singles Chart Top 100 - 29 September 2017". Official Charts Company. Retrieved 30 September 2017. "Forever & Ever More": "Official Scottish Singles Chart Top 100 - 26 October 2018". Official Charts Company. Retrieved 26 October 2018. ^ "Netherlands Single Tip Chart - September 22, 2018". MegaCharts. 21 September 2018. Retrieved 14 September 2018. Wikimedia Commons has media related to Nothing But Thieves.